It is a delight to have the band back together again in Birds of Prey: End Run, both characters and creators, though the book feels more like a two-hour reunion movie than the start of an ongoing series. In contrast to Birds of Prey launches previous, the focus is less on the Birds saving others than saving themselves, which gives the story a one-off, personal feel. I'm glad the Birds are back together, though in the end their new mission isn't quite clear to me. DC's been rather mum on the exact date and time the idea for the new relaunch came about; if I had to guess based on what I can intuit from interviews and such, I'd bet writer Gail Simone did not know about Oracle's return to Batgirl at the start of the new Birds of Prey series. And yet, with Simone's new Batgirl on the horizon, her portrayal of Oracle here makes it not such an outlandish concept. 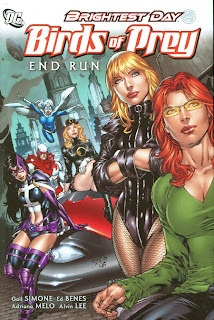 Oracle gets her own story in End Run involving sometime-allies Savant and Creote while Black Canary and Huntress are off battling the mysterious White Canary, so it's not as though Oracle is idle in the book. Until Savant and Creote kidnap her, however, Oracle mostly worries about her teammates through their audio receivers; after the titular "End Run" story, she's mostly absent through the two-part concluding "Two Nights in Bankok." When Savant dangles Oracle's wheelchair off the end of a dam, Oracle thinks about how she would previously run along the edge "in heels" as Batgirl; though she's strong enough to catch Savant when he jumps off the bridge himself, she still needs Creote to help pull Savant up. There's nothing wrong with Oracle considering her past life nor having to ask for help, but there's a certain wistfulness here in Simone's portrayal of Oracle, not to mention the character's general impotence in the story. Even if I didn't know that a change was on its way, chances are I'd still be advocating for Oracle to be in the field more -- questioning suspects, sneaking around, getting into fights -- something that's hopefully on its way in the next volume's ominously titled Death of Oracle. End Run rests heavily on three other of writer Simone's Birds of Prey stories -- Of Like Minds, The Battle Within, and Perfect Pitch -- with so much detail in fact that I had to pull the three to remind myself about some of the characters interactions. Less notable, I thought, than the conflict with White Canary was the aforementioned return of Savant and Creote, and how their kidnapping of Oracle evokes their kidnapping of Black Canary in Of Like Minds, Simone's first Birds book, reinforcing the feeling of new beginnings giving deference to the old. In an excellent twist, Savant and Creote seem the villains of the piece, though they don't actually end up as such. Instead, Savant's mental breakdown reminds Oracle of her tendency toward arrogant self-reliance, and her habit of taking her associates for granted that she thought she'd curtailed. That End Run recasts several stories relating to Savant and Creote is good -- showing what Oracle thought was rehabilitation to instead be considerable harm -- because it sets volume two apart as a clean break distinct from what came before. Ultimately, though the beginning and middle of End Run pertain mostly to Oracle and Black Canary, "Two Nights in Bangkok" largely the Huntress's. In fact, if I had to characterize End Run succinctly, I'd say this is Huntress's Battle Within and Perfect Pitch, compressed. The White Canary means to pit super-martial artist Lady Shiva against Black Canary, but Huntress steps in instead, and manages to hold her own against Shiva, if not exactly cleanly. Defeating Shiva has been a rite of passage for Bat-characters. For Simone to pit Huntress against Shiva is to continue Birds's process of giving Huntress the recognition she deserves, just the same as this title did for Black Canary. That Huntress does it "her way" is perfect, splattering blood in Shiva's face rather than developing some outrageous fighting skills and becoming essentially a second Canary; I also appreciated Simone's reminder more than once that Huntress is willing to kill while Black Canary isn't, further defining the two characters as individuals. End Run is enjoyably action-packed, with a number of successful surprises, and again it's great to have Simone and artist Ed Benes back together with these characters. I did worry whether familiarity breeds a certain amount of ennui, however; when the Birds reunite, the ordinarily stoic Huntress bursts into tears, and there's more than one scene given to the Birds telling each other how much they feel for one another. Sure, it might be nice if Superman and Batman were so open for a change, but the echoes in End Run of earlier Birds stories reminds me things were not always so rosy between the Birds -- and maybe it was better that way. That the Birds know each other so well and care about each other so much borders on the melodramatic, and there's little drama when Canary abandons the Birds for a stint, for instance, because we know she'll be back and because we've seen a lot of this before, even if we enjoyed it both times. Indeed, as End Run comes to a rather sudden conclusion, there is no talk here of how the Birds will continue as a team, nor as to whether or why the heroes Hawk and Dove will be joining the group (the duo do a lot of just standing around throughout). There's some implication in the book that the Birds will now be outlaws in Gotham City (unless that's cleared up by White Canary's defeat), but it's not specifically addressed in the end. I don't object to a super-team that fights crime together just because they like one another, but End Run lacks Of Like Minds's sunrise-set forward-looking ending. Likely much of this will be addressed in Death of Oracle, but the end of End Run leaves the story feeling not quite concluded. End Run's story, at least, lends itself fairly well to the collected format, in that even despite there being two titled stories here, they're essentially of a piece. Ed Benes leads a number of fill-in artists whose style is sufficiently close to his own, and End Run's first issue especially is quite beautiful, with Benes's definitive take on the Birds and some advanced coloring highlighting the tones in the characters' hair and costumes. But unfortunately Benes gets a couple of inkers who aren't quite the right fit, and from the second issue on really nice pages sit side-by-side with ones that look dark and rushed (see page two and three of the second chapter, where the characters seem especially frozen in position); in the third issue, an artist draws a conversation between Canary, Huntress, and Lady Blackhawk in which they're all in the same room but Blackhawk is entirely off panel, and there's a shot of White Canary pummeling Black Canary toward the end of that issue in which Black Canary's leg seems to begin halfway up her body. Someone also saw fit to give the character's descriptive boxes explaining their powers at the start of every single issue; this might've been useful for the monthly comic, but it's repetitive and distracting and the trade, and should have been taken out. Given End Run's loose ties to Brightest Day, DC included a Hawk-and-Dove-centric Brightest Day excerpt at the end of this book. This is a great touch, as was the Green Arrow preview at the end of Justice League: Rise and Fall. Not only does it offer a few more story pages for the purchase price, but it acknowledges that trade readers are just as much a part of the DC Universe as monthly buyers, and want to be pitched to and teased about new storylines as well. Two thumbs up and here's hoping for more of the same. The DC Relaunch announcement is just two weeks past, and already we're in this kind of awkward position where there's one if not two more collections of this Birds of Prey series still to come, and yet we already know the book is cancelled and the characters on the cusp of being radically changed. I'd have bought Birds of Prey: End Run anyway, I'm pretty sure, if only to see the classic Simone/Benes team back together again, but it's hard not to intuit shades of things to come in what I'm reading now, even if those connections might just be coincidental. That said ... coming up next is our review of the New York Times bestselling Batgirl: The Flood -- don't miss it! I chose to send DC a message about my displeasure at them releasing this in hardcover initially. I did this by hacking off the head of their prize racehorse and.. nah, actually I just decided to wait for the tradepaperback. Take that, you DC fascist bigwigs! That'll learn 'em. My guess is every new title coming out of the initial DC relaunch will see hardcover release before paperback. Unfortunately for paperback waiters, I think hardcover is becoming more the rule than the exception.